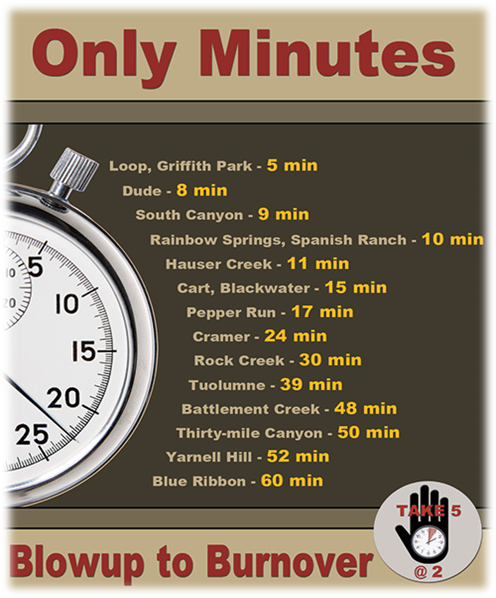 The 6 Minutes for Safety Subcommittee (6MFS) provides national leadership and oversight of the 6MFS program. The Subcommittee is responsible for the development, maintenance, and distribution of the 6MFS platform, which delivers the daily topics, This Day in History, and the Wildland Firefighter Week of Remembrance. Provide daily topics to help firefighting personnel to actively troubleshoot known high risk situations encountered on the fireline. Promote a vigilant fire safety culture by supporting the daily use of 6MFS by every firefighter and every fire program. Develop critical thinking skills and awareness by creating meaningful learning opportunities for firefighters. Proactively seek and sustain vibrant and collaborative relationships with other wildland fire partners such as the Wildland Fire Lessons Learned Center, the Hazard Tree Subcommittee, the Wildland Fire annual refresher group, Missoula Technology & Development Center, the Wildland Fire Leadership Subcommittee, and all field personnel. Every day there is a least one 6MFS entry. The calendar also includes a link to the word document inserted into the daily Incident Management Situation Report.